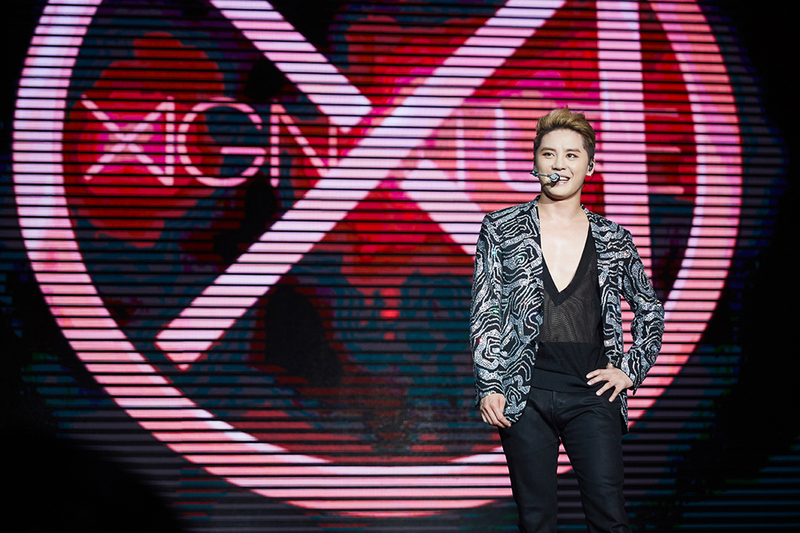 2016 XIA 5th ASIA TOUR CONCERT ‘XIGNATURE’ was the fifth international concert tour by JYJ’s member Kim Junsu (XIA). The tour was organized to support his fourth full-length album, Xignature. 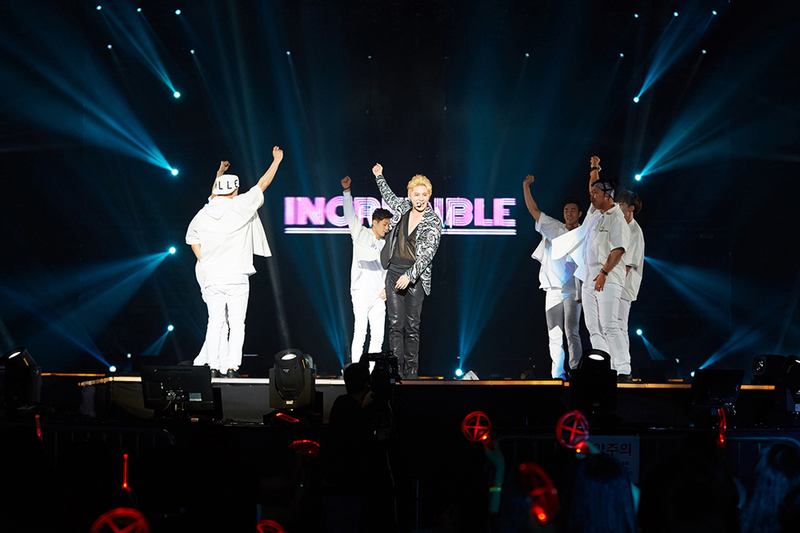 XIA held 15 shows in eight cities across Asia. The tour was XIA’s last headlining tour before hiatus for two years to complete his South Korea’s military service. XIA performing “XITIZEN” in Seoul. Photo: C-JeS Entertainment. The announcement for a new Xignature album and Asia tour was made through a surprise video during the end of the finale show of 2016 XIA THE BEST BALLAD SPRING TOUR CONCERT vol.2 in TOKYO on March 31, 2016 with the dates of the first nine shows of the tour. In the Xignature tour, XIA performed songs from his Tarantallegra, Incredible, Flower and Xignature albums. Stage rehearsals began on June 10, 2016 in Seoul Olympic Park Gymnasium. The show lasted for about three hours. XIA was supported by 20 domestic and international backup dancers. MelOn Ticket was the ticketing agency for the shows in Seoul and the sales took place on April 29, 2016. On the following day, C-JeS Entertainment was notified on illegal premium ticket sales sold at different methods instead of MelOn Ticket. The illegal reserved tickets were completely cancelled on May 16, 2016 and the sales for the cancelled seats were re-opened in the following week. 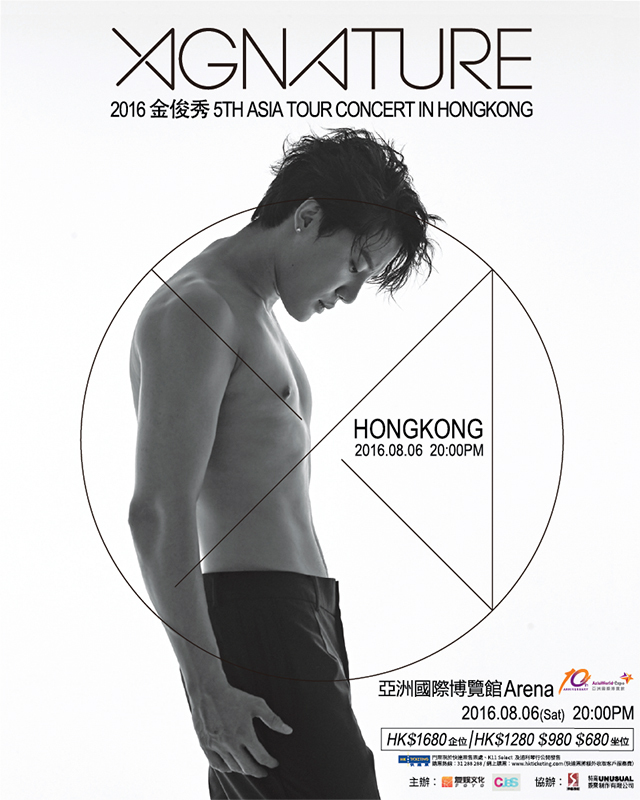 On June 9, 2016, C-JeS Entertainment announced four more dates for the Asia tour which included stops in Guangzhou, Bangkok, Shanghai and Hong Kong. Two additional concerts in Yokohama announced on June 9, 2016 were scheduled to take place on July 8 and 9, 2016 due to an increasing demand from the Japanese fans. XIA on stage in the Shanghai concert. Photo: C-JeS Entertainment. About 17 songs were performed in each show with more than 10 different genres. “How Can I Love You”, an original soundtrack from the TV drama series Descendants of the Sun, was included in the set list. XIA held a ‘Genie Time’ corner, where he grants three wishes of his fans on stage, throughout the tour. For the finale show in Seoul, “Magic Carpet” was performed for the second time as a triple encore. XIA sang a piano rendition of “살다 보면(As We Live)” from the original soundtrack of Musical 서편제(Seopyeonje) and “Tsubomi (蕾) (츠보미)” during the Pacifico Yokohama shows, replacing “Tonight” and “Tarantallegra” respectively in the set list. “Tarantallegra” was later performed as a triple encore on the July 9, 2016 show only. For the tours in China, XIA performed one cover song in Mandarin which was one of the original soundtracks of a Taiwanese film You Are the Apple of My Eye, “Those Years”. In an interview with Ilgan Sports prior to the shows in Seoul, XIA revealed that he took part in designing the concert according to the new album. 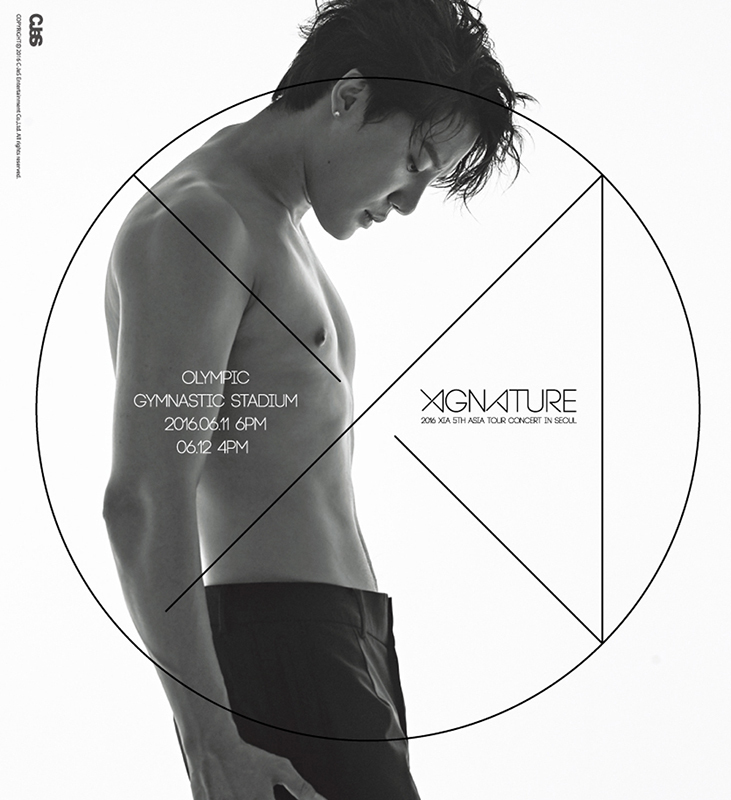 A teaser photo taken from the Xignature album photo shoot for the Seoul concert was unveiled on April 28, 2016 while the first promotional poster for the same show was released on May 24, 2016, showing a shirtless XIA posing in front of a white background. A special concert website was set up for the tour in Japan on May 20, 2016. Banners were put up along the streets in Seoul on May 27, 2016. An exclusive video message by XIA for the Bangkok concert was released on June 23, 2016. A press conference was held for the tour on June 11, 2016 at 4:30PM local time in Seoul Olympic Park Gymnasium. The Shanghai press conference took place on June 23, 2016. The crowd in XIA’s Kobe show. Photo: C-JeS Entertainment. Sechs Kies’ Kang Sung Hoon attended the second Seoul concert and went on stage during the ‘Genie Time’ corner on June 12, 2016. The Kobe shows attracted fans from Germany, Czech Republic and Australia. XIA was visited by his mother during the finale show in Yokohama. Ticket sales for the Seoul concerts were delayed for seven minutes after MelOn Ticket’s website experienced a server down when fans started to jam the site 10 minutes prior to the sale time. All of the tickets were completely sold out only ten minutes after they were opened. “Tonight” and “Tarantallegra” were replaced with “살다 보면(As We Live)_Piano Ver.” and “Tsubomi (蕾) (츠보미)” respectively in Pacifico Yokohama. “Tarantallegra” was replaced with “那些年(Those Years)” in Guangzhou, Shanghai and Hong Kong. Yokohama Arena concert goods. Photo: C-JeS Entertainment. The list of goods was revealed one day ahead of the Nagoya concert through JYJ Japan Official Website. The sales of the merchandise for the Nagoya shows began at 12:00PM local time on June 18, 2016 and 11:00AM local time on the following day. The Seoul concert merchandise were not fully available for shows in the overseas and some items were removed or added depending on the demand of each country visited. Six official merchandise were sold in the Korean leg and were only available through pre-orders made from June 7, 2016 to June 13, 2016. 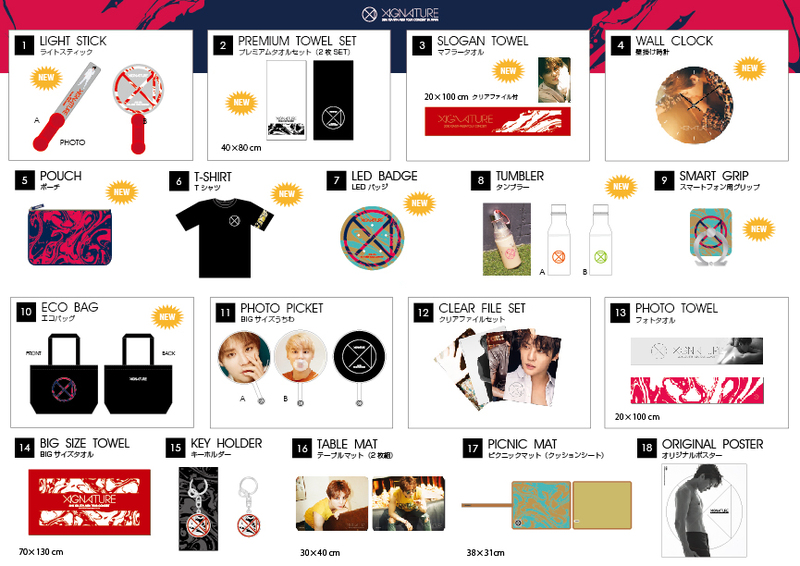 For the Nagoya shows, C-JeS Entertainment retained the same T-shirt, Eco bag, iPhone case and key holder, and added new light stick, slogan towel, photo picket, lunch bag, clear file set, picnic mat and original concert poster into the list. In Kobe, new designs were given for the slogan towel, while adding new Type B photo picket and Type A and B key holders. A new table mat, necklace and big size towel were included in the same concert. For Yokohama Arena leg, six new additional items were introduced which included a premium towel set, wall clock, pouch, LED badge, tumbler and smart grip for phones. A new type of light stick was sold in this concert (type A), while the slogan towel and T-shirt (type B) were given new designs. The existing tumbler and Eco bag from the Seoul concert were also available, totaling 18 items for this show. This table is representative of the sales in Nagoya, Kobe, Yokohama (Yokohama Arena), Yokohama (Pacifico Yokohama) and Hong Kong. This page was last modified on August 10, 2016.